On the next day after the feast of the Baptism of the Lord, the Holy Church glorifies the Forerunner and Baptist John (about him see Mt. 3:1-16; 11:1-19; 14:1-12; Mk. 1:2-8; 6:14-29; Lk. 1:5-25,39-80; 3:1-20; 7:18-35; 9:7-9; Jn. 1:19-34; 3:22-26), as such a man, who, having been included himself in line with holy prophets, foretold about the Savior of the world, having preceding the manifestation of the Son of God in the flesh, and who was worthy to baptize the Lord in the Jordan. 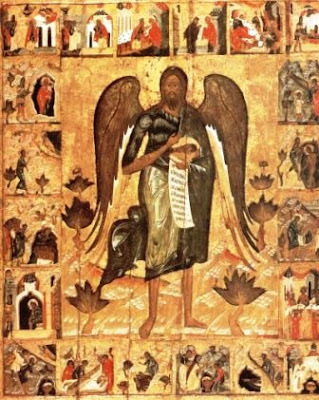 The Holy Church glorifies him, as "the angel, the apostle, the martyr, the prophet, the chandler, the friend of Christ, the seal of the prophets, the mediator of the old and new grace, in birth most honorable, and the voice of the Word of light". In the words of the Blessed Augustine, "he surpasses all, he has the advantage before all; everyone who is born from a woman only, is lower than John". Related to the Lord through his mother, the son of the priest Zechariah and Elizabeth, the Forerunner of the Lord anticipated the birth of the Lord by six months. The Angel Gabriel foretold his birth to his father Zechariah in the temple. And to the god-fearing couple, who up to advanced old age were deprived of the consolation of having children, is born the son of consolation, who was petitioned by their prayers, the foreteller of higher things, who was filled "with the All Holy Spirit while yet in the womb", whom "his mother carries inside and who leaps for joy rejoicing in the beautiful fruit of the Virgin", who was announced. Saved, by God's mercy, from the death that overtook thousands of children in Bethlehem and its vicinity, St. John grew up in the wild and barren desert, preparing himself for great service by a strict way of life, by fasting, by prayers and the awesome reflection about the fate of the people of God. He remained as a desert dweller until that time when the Lord called him for the general preaching to the Judaic people. Obeying this calling, St. John, about 30 years old, appeared on the shores of the Jordan, as the enlightened "glory of the preexisting benefactor", "the greatest of all prophets" and "the truest preacher", who through his preaching prepared the people to accept the long awaited Savior, the Messiah, that by the strength of his service will present Him to the prepared people. As expressed in the church hymns, St. John was the morning light, "the star", which by its brightness surpassed the light of all the other stars and foretold the dawn of the thankful day, when Christ shines as the spiritual "Sun" (Mal. 4:2). Having baptized the sinless Lamb of God among all those sinners who came to him, St. John finished his service as if this act sealed all of it. He died as a martyr. As a preacher of penance, he strictly and fearlessly disclosed the vices of the people, and all honored and respected him as a prophet. King Herod married Herodias, the wife of his brother Philip, who was still living. 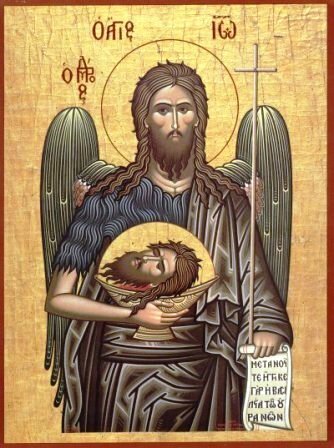 St. John "with conviction" accused the king as "the lawless one", and for it he was put in prison and then beheaded by the sword at the request of Herodias. The memory of the righteous is celebrated with hymns of praise, but the Lord’s testimony is sufficient for you, Forerunner. You were shown indeed to be the most honorable of the prophets, for in the waters you baptize the One whom you preached. After suffering with joy on behalf of the truth, you proclaimed even to those in hades the God Who appeared in the flesh to take away the sin of the world, and Who grants us great mercy. 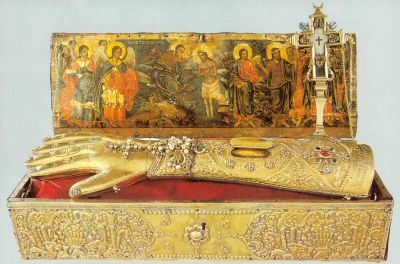 * Another portion of the right hand of John the Forerunner is in Dionysiou Monastery on Mount Athos.